I got back to Sunset Park walking this week, but only managed a few blocks on 57th before straying. 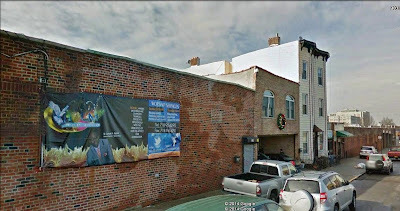 Near Seventh, I saw the Iglesia Cristiana Pentecostal "La Piedra Viva,"
which was once the First Norwegian Free church, and then later, according to an added plaque, the Evangelical Assembly of God Eben-ezer Tabernacle. 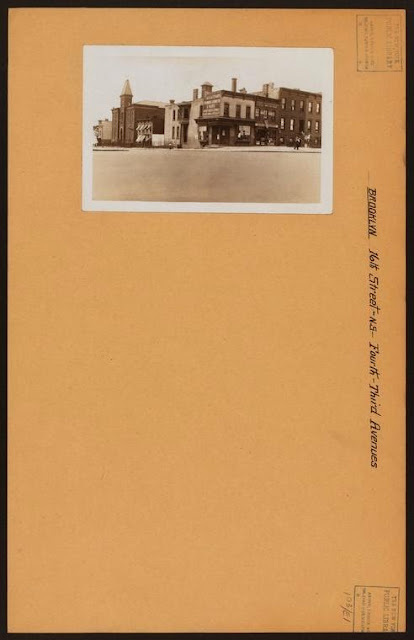 A 1932 Eagle article refers to a new building at this site as the home of the Norwegian Baptist Church, who had been temporarily meeting at a store on Seventh Avenue, and before that worshipped for twenty-nine years in the Mariners Temple, Manhattan. 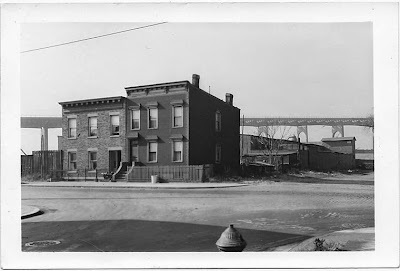 I don't know when the Tabernacle took over the space - the movement & lodging of congregations at different locations throughout the borough, even today, is hectic. I did find a 1970 NAHA (Norwegian American Historical Association) article on the history of Norwegians in New York which proved quite interesting, especially as it described the migration of the Brooklyn Norwegian contingent in Red Hook, south, through Park Slope, & into the Sunset Park/Bay Ridge area. 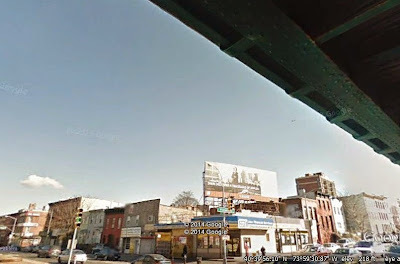 At Ninth Avenue, I should have headed around & turned back down 56th, but instead I kept going to Fort Hamilton Parkway and took it south, past Leif Ericson Park & into the 70s. I stopped at the My Three Sons Greek diner for a coffee, and wished I'd had time to stay and eat. At the counter a bald, heavy, middle-aged man with crutches was drifting quietly down into afternoon sleep, though the booths were lively with the chatter of elderly women. It was small enough in here to feel like someone's living room, and would be a good place to listen to stories. The men in white working the place had a nice, sober, old-school courtesy about them, even in the act of serving a dollar cup of coffee. I'd be back. This one's got a lot of class. 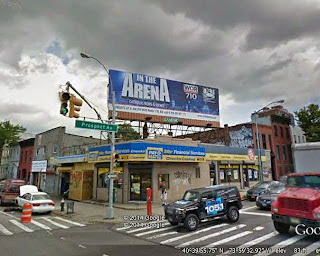 Last trace of the church-into-auto-center at Fourth & 15th. Continuing (concluding?) our Santa-face themed mini-series, here's a favorite of mine from 19th Street, visited today on Christmas afternoon, while walking the dog. Happy Holidays to all! What's this? Another notice at Jo, Brian and Tony & Henry & Billy & Frank & Joseph's Key Food, at Fifth & 12th Street? The store has been closed since early October, ostensibly due to an "extensive power outage", and despite promises to return soon "better than before" (not that hard to achieve, any one that shopped there mused) it has stayed shut. So what does the latest note have to offer? An eviction notice, for non-payment of rent ($30,000 and change). This looks like the end of the road for the superette. Now that's worth a trip to 17th Street this Thursday. Christmas food! When I took a few seasonal pictures over the weekend, I didn't notice that the same Santa face appeared in all of them. Above: the jolly Santa no. 3. Oh, but this is beautiful. Christmas Greetings From the Neighborhood! Time to get out and about to enjoy the Christmas decorations. I realized today how sparsely decorated our block is these days. In years past apartment windows were blasts of color, strung with lights running rapid sequences of red, blue, green, red, blue, green. Creche figures and fat plastic soldiers & choirboys took their annual stations in front yards. Now polite restraint is the order of the day. But walk around a bit & you'll still find some happy exceptions! We'll celebrate a few of them this week. Our local Santa values (dubious) style over convention. Let's revisit a little old house on 11th Street. I pass by this one most days. Back in June, I saw that 147, tucked between Second & Third, was on the market (RE/MAX brokers) at a mind-boggling $1,899,000. 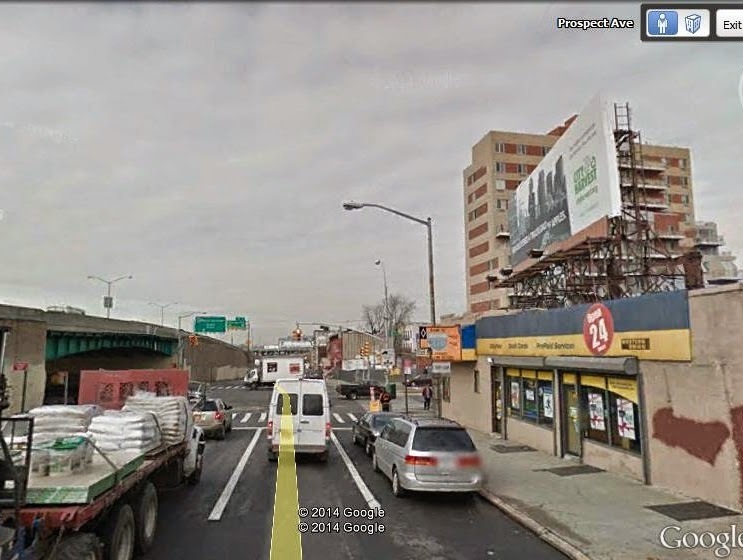 A development-site pitch here, given the property's much-coveted twenty-five foot width. What I hadn't realized was that a month earlier Fillmore had listed the 147 for an even wilder $2,250,000. As summer turned to fall, the price shifted down, to $1,299,000 (July) to the current $899,000 (September). There's been a stop-work full-vacate order in place since May (before it was listed by Fillmore at over two million), apparently related to fire damage. The rabbits of Third Avenue continue to work on their own development projects and are now able to disappear completely into several of the holes they're excavating. Back of the tire shop there are hutches provided for them, seen here from an adjoining MTA lot. Another corner on Fourth is heading for Development And Conversion. 575-581, at Prospect Avenue, is under contract, according to CPEX, the brokers handling the sale. The businesses currently at this corner are Prospect Auto Glass, a tire repair shop, and a check-cashing center. Next door to this parcel of properties, at 573, a carriage-house was recently demolished to make way for a skinny nine-storey (plus obligatory penthouse). 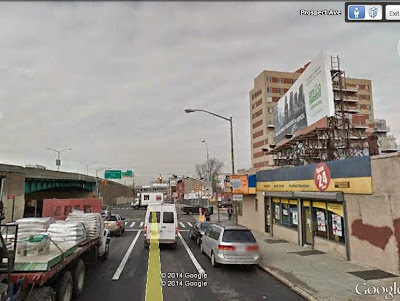 Goodbye auto shops, and hello expressway views from your terrace! The now vanished two-storey building at 98 16th (see the building site below), sold in May for $780,000. 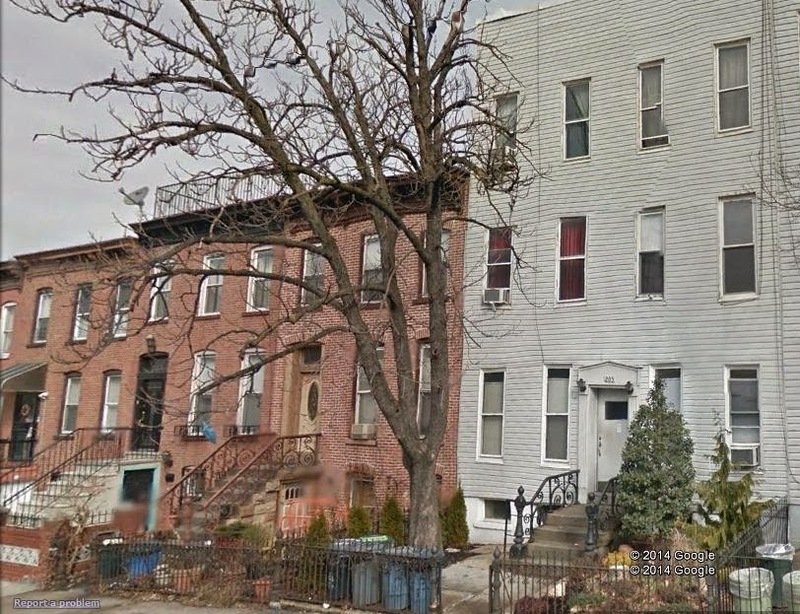 96 sold in August for $1,200,000, ten months after it changed hands for $885,000. On a street where a number of houses sit below street level the Lilliputian number 92 (far right, above), looks lowest of them all. Underneath that brickface there may be an early wooden building predating anything else on the block. There are a number of small, detached houses like this, almost subterranean, still left in the teens & twenties streets around here. The scale of building size shown here, with high-rise towering over modest nineteenth & early twentieth-century housing, is a familiar sight on the blocks directly off Fourth Avenue. December 13, 2014. Both 115 & 117 sport identical No Littering signs in their windows. Will the sign at 115 come down before today's Open House? One of the properties listed this week in the South Slope News Open House Roundup is a single-family house at 115 16th Street, on the market for $1,149,000 (recently reduced from $1,200,000) I was interested in this one, as I've often photographed this little house and its next door neighbor, at 117. They're nice little houses, but have been neglected over the years. They're 14 feet wide and 22 feet deep. According to Corcoran floorplans, 115 has a small, seven foot wide extension & its square footage is given online as 795 sq. ft. The lot size is listed as 565 sq. ft. 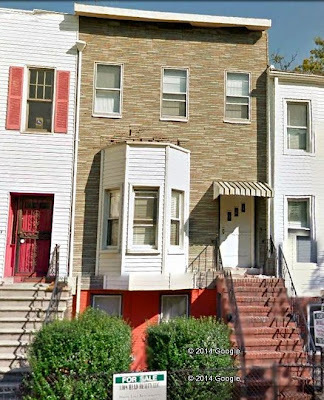 The Corcoran website for this property mentions a garden, but doesn't show one on the floorplan. You can see the two houses, complete with awnings, in a 1930 Percy Loomis Sperr photograph. The finances on these properties look murky. One Carlyle Ebanks bought both houses from the same owner in 2006 - 115 for $445,000 and 117 for $435,000. Ebanks resold 117 just months later for $625,000 to an Althea Winston. Winston transferred the deed later in 2006 to 450 Carlton & Prospect LLC. This spring the property changed hands again for $20,000, to Aota LLC. 115 was put on the market several times in 2006 and 2013 but did not sell. Ebanks held on to it until a year ago, when he sold it to Magab Inc. for $320,000 - a rather surprising price given property appreciation in the six years since he bought it. For what it's worth, Ebanks was convicted of in 2010 of second-degree grand-larceny and multiple counts of falsifying business records in 2010 through his involvement in a straw buyer scheme. FAIL TO MAINTAIN BLDG WALL OR APPURTENANCES. NOTED APPROX 30% OF ROOF UF MISSING. FRONT FACADE HAS SEVERAL CRACKS. 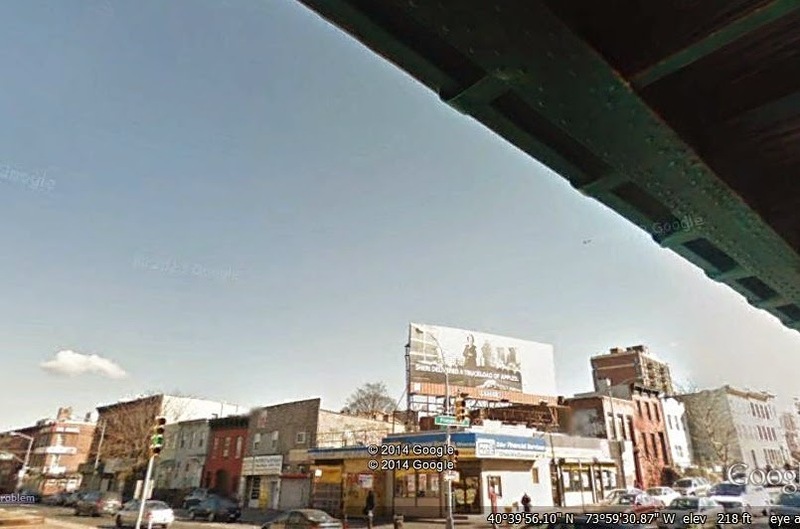 If you had a million-dollars-plus to buy yourself a piece of hot Gowanus, you might just think twice about buying next-door to a house in such dire condition. You might take a serious look at the condition of the freshly renovated "sweet and cozy" 115. You might look across at the demolition site across the street and consider what splendid building will be coming in there soon. You might think twice about living anywhere close to a prime corner lot on Fourth Avenue, which is doubtless lusted after by any number of real-estate developers, You might wonder at the price-tags realtors are putting on houses like this. Yesterday, right after breakfast, I got a text informing me that the archway windows at the station were now opened up from inside. Getting this text confirmed my fears that I have become something of a station anorak. So be it. The windows have only been uncovered from the northern side, but I guess the other side will be unveiled soon. I was disappointed to find that the glass is opaque, so there's no chance of any moody staring up or down the avenue. But the falling light here, patterned by archway gridwork, makes for a fine place to start a journey, and after years of construction barriers, and steadily increasing ridership, it's great to get a wide platform back again. Strangely, this picture makes the renovation look more like an architectural rendering than the real thing. Downstairs, under the bridge, I saw that the last of the subway signs (east side) was up, and both signs here were now lit. 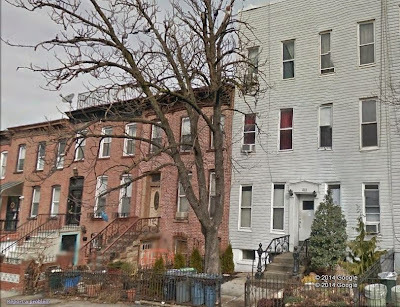 An 1870s frame rowhouse on 12th Street sold last month for $1,600,000. 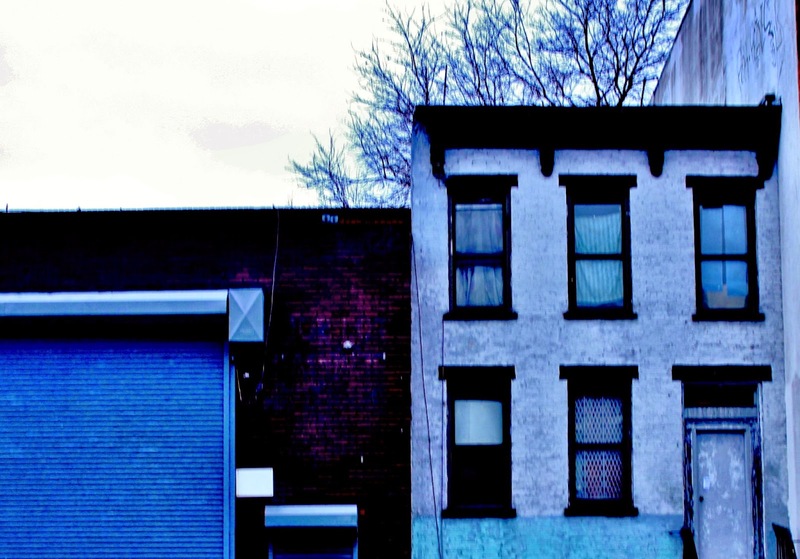 "An indolent American princeling (Beau Bridges) purchases a dilapidated row house in a black, but changing, Brooklyn neighborhood ... (Park Slope) ... learning something about race and what would be called "gentrification" before retreating back into his money. This mock bildungsroman, directed by Hal Ashby from Bill Gunn's adaptation of Kristin Hunter's novel, is at once broad and nuanced in its characterizations. (Gunn was also responsible for scripting The Angel Levine's kindred fable of racial tension in a New York tenement.) The Landlord received mixed reviews, in part because of its shifts in tone, from the screwball antics of Bridges's idiotic family to the pathos of Diane Sands's career performance as the tenant with whom the landlord becomes most involved." 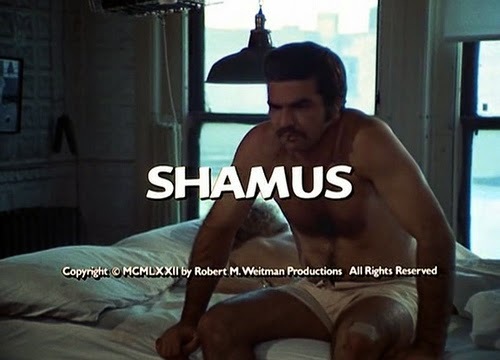 In my part of the (South) Slope, the 70s would bring instead Shamus (1973), starring Burt Reynolds as a Brooklyn private eye, hired to recover a cache of stolen diamonds. 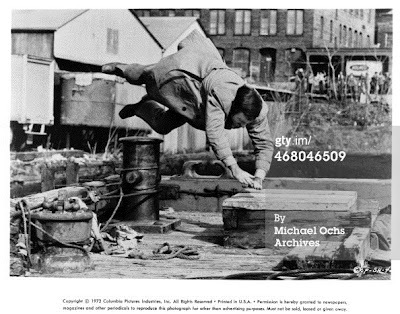 It may not be as critically significant as The Landlord, but it has terrific location shots of my part of town forty years ago. Look, there's Burt, heading down Fifth past Timboo's. And there's Burt clambering on the banks of the Gowanus, right where Whole Foods stands today. And according to Mary Ann Pietanza, a Brooklyn native writing in the Red Hook Star, Burt was a stand-up guy with on-location spectators, friendly, & happy to chat and sign autographs. I wish this film was available on Youtube too, but we'll have to be content here with a trailer and a coupla stills. Some recently sold multi-families, ready to go the develop/re-position route. 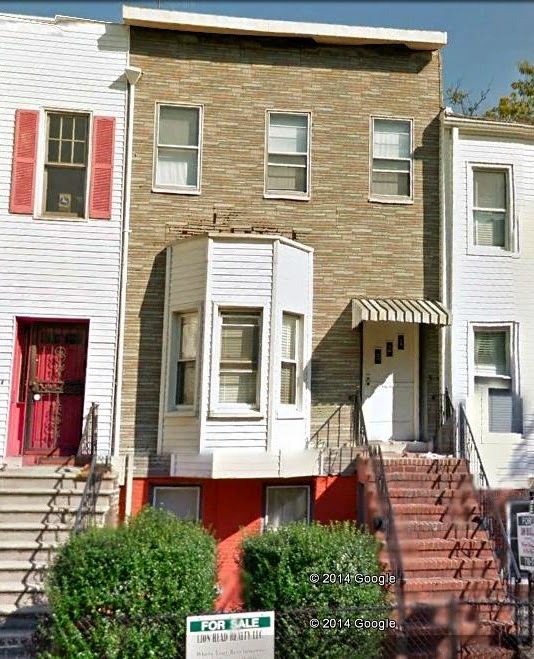 A six-unit building sold in September for $1,450,000. Previously sold 7/12 for $915,000. 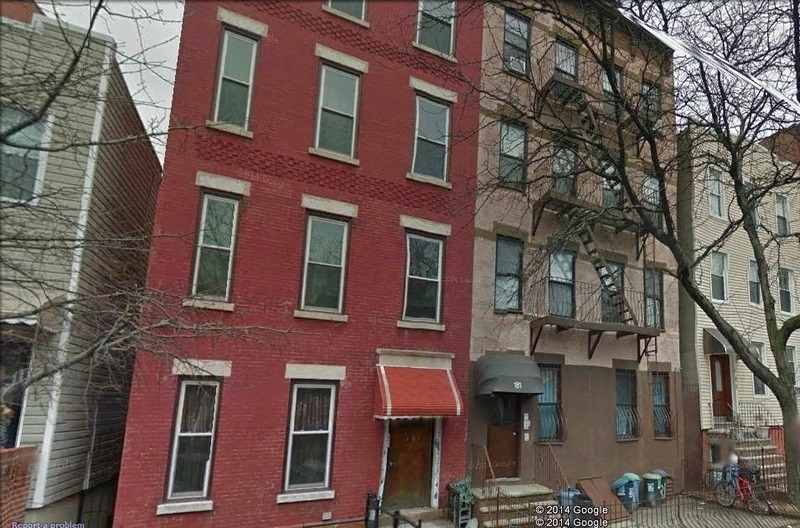 A nine-unit building sold in September for $1,390,000. 5-6 building class (C3), with "first 3 alternate addresses" at 200 Rear 28 Street, a back house, which according to DOB records was vacant twenty years ago & in danger of imminent collapse. No work recorded to remedy this. Wild days at the station. Around 4:50 today I exit the train and notice that the 10th Street entrance (east of Fourth) is now open! Pretty exciting, if you've slogged through so many years of station renovation. Still, you think, rather cynically, they haven't got that illuminated-sign business sorted out yet... And then, at that very instant, at 4:55 (nothing cliched here, like an on-the-hour schedule), it's almost like Christmas! Not just east, but west too. We live in heady times.